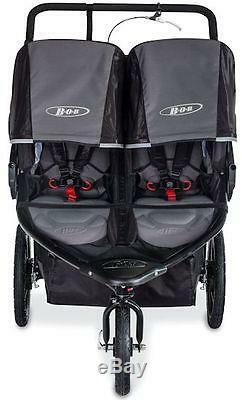 2017 Bob Revolution Pro Duallie All Terrain Twin Baby Jogger Jogging Stroller Black. A BOB is more than just a baby stroller. 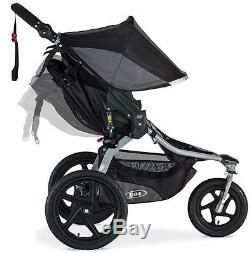 The Revolution® PRO DUALLIE® is BOB®'s most deluxe on- and off-road stroller for larger families. Fully loaded for all your adventures, this stroller is perfect for intense workouts or casual strolls, when you want both kids along for the ride. The Revolution PRO DUALLIE is amazingly versatile. It has hand-activated rear drum brakes for maximum control on downhill slopes, so when youre picking up speed or hitting some hills, your little ones are safe at hand. This stroller can go anywhere. The front wheel swivels, which allows for easy maneuverability through parks, city streets and other tight spots, but also locks for added stability when jogging or taking on rough terrain. And the Revolution PRO DUALLIE boasts an ultra-smooth ride for your little adventurers. The state-of-the-art adjustable suspension system takes bumps in stride. Boardwalks, beaches and trails are no match for this stroller. As for pushing, the adjustable handlebar offers 9 positions to provide a perfect fit for parents of different heights. One-hand recline makes adjusting the seat angle a snap, and fully upright seating lets your kids take in all their surroundings. And keep all your supplies, gear and even a few toys in the extra-large cargo basket. When youre done for the day, fold the stroller in seconds for easy storage. Combine the Revolution PRO DUALLIE with an infant car seat, like the BOB B-Safe 35 by Britax®, to create the best travel system for your lifestyle. Take your adventures to the max with the BOB Revolution PRO DUALLIE. BOB, the #1 jogging stroller. Hand-activated, rear drum brakes for the best downhill control. Swiveling-locking front wheel swivels to maneuver tight turns with ease or locks forward for increased stability when jogging or on rough terrain. Adjustable padded handlebar offers 9 positions to create the perfect fit for parents of all heights. State-of-the-art adjustable suspension system offers 3 inches of travel and 2 stages of weight support for an ultra-smooth ride. Easy 2-step fold for convenient transportation and storage. 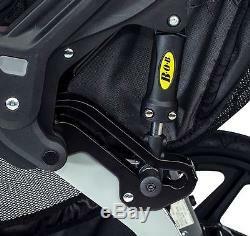 Travel system-ready when using the BOB DUALLIE Infant Car Seat Adapter (Not Included). Pair with a matching BOB B-Safe 35 Infant Car Seat by Britax or with any other major brand car seat. Air-filled tires on high-impact polymer wheels make for a smooth ride whether on-road or off-road. One-hand recline adjustment lets you quickly lay the seat back with the simple squeeze of a button. Fully upright seating position so your child can see the world on all your adventures. Ultra-padded seat with ventilation and a five-point harness keeps your child comfortable and secure. Extra-large UPF 50+ canopies shield your children from sun and weather. Includes large viewing windows so you can keep a watchful eye on both children. 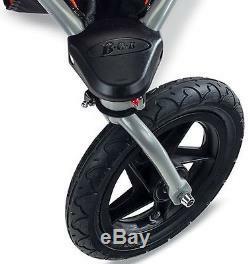 Enhanced quick-release design makes it easy to securely attach or detach both the front and back wheels. Adjustable front wheel tracking helps correct alignment with a simple twist of the knob. Foot-activated parking brake secures stroller in the stopped position. 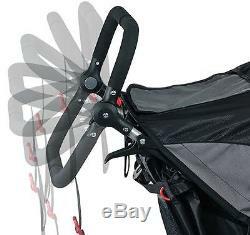 Wrist strap provides safety while running and includes a buckle to lock the stroller closed when folded. Two-seat duallie design transports 2 children with a 50 lb weight capacity for each seat, yet is slim enough to fit through most doorways. 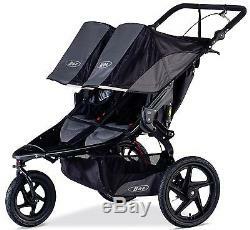 Renowned quality and performance make BOB the #1 Jogging Stroller. Weight (Net): 36 lb, 16.3 kg. 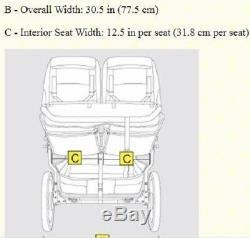 Capacity: 8 weeks of age to 50 lbs / 22.7 kg per seat; 100 lb / 45.4 kg total, occupant plus luggage; from birth with the use of an Infant Car Seat Adapter and compatible Infant Car Seat. Maximum occupant height is 44in, 112cm. 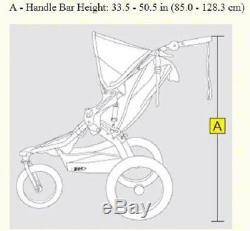 Do not exceed maximum weight or height, as stroller could become unstable. Frame Materials: High-strength aluminum alloy. Seat Material: Poly and dobby weave fabrics with water repellent coating and open-cell foam padding. Seat Care: Sponge area with a solution of lukewarm water and mild soap. Rinse thoroughly with clean water to remove all soap and allow to dry. Seat Recline: One-hand adjustment, down to 70° from vertical. Suspension: Coil spring and elastomer core shock absorbers provide three inches of wheel travel. Adjustable shock release knobs allow for two shock positions to fine-tune suspension for varying occupant sizes. Tires: Pneumatic tires with tubes and Schrader valve. Rear 16" x 1.75", Front 12.5" x 1.75". Front Wheel Hub: Thru-axle design for enhanced security. Quick-release lever for easy installation/removal without the need for tools. Sealed cartridge bearings for low maintenance and durability over time. Rear Wheel Hubs: Quick-release levers for easy installation/removal without the need for tools. Wheel Rims and Spokes: High-impact polymer composite. 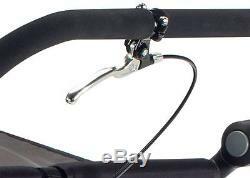 Adjustable Padded Handlebar: Choice of 9 position options, 180° range of motion. Storage: 2 interior seat pockets, 1 large seatback pocket and an extra-large cargo basket underneath seat. 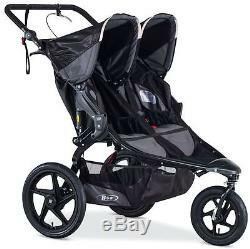 The item "Bob Revolution Pro Duallie Jogging Stroller Twin Baby Double Jogger 2017 Black" is in sale since Tuesday, January 30, 2018.